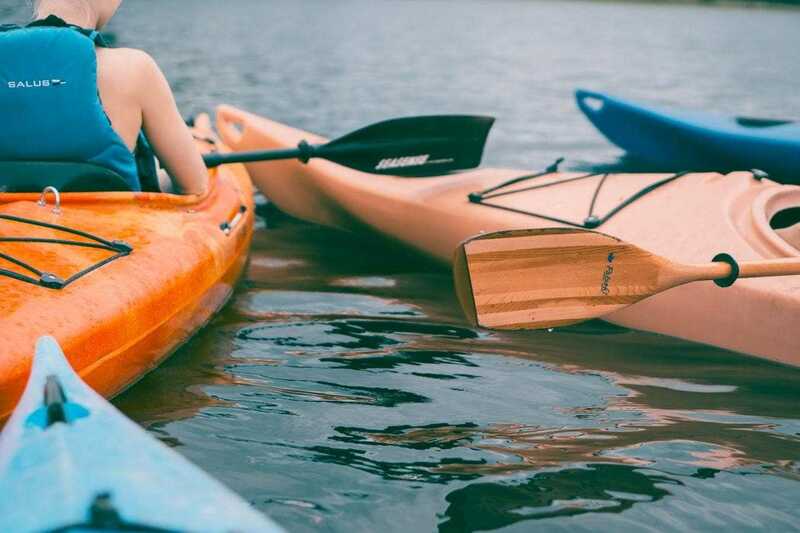 If you’ve ever gone out kayaking only to cut short your voyage due to poor gripping footwear, or have to constantly worry about draining them, you will undoubtedly reckon the importance of getting a trusty pair of water shoes before cruising the waters. However, with so many brands and designs out there, getting the right pair of kayak fishing water shoes can be a mazy decision, and even more so if you’re a beginner looking to see what the waters have in stock. Fortunately, we have the jigsaw cracked for you already. Check out these 5 water shoes and be in pole position to get the best out of your kayak fishing experience. The Crocs Swiftwater Sandals solves many problems you are likely to encounter when kayak fishing. The water shoe comes with a mesh layer that aids faster drying and a wrap-around toe bumper that can be crucial in rocky waters. The odour control feature douses all worries of repugnant smells and the adjustable strap ensures the shoe fits perfectly. Whether paddleboarding or scouring for agates on shore comes to mind, the Crocs Swiftwater sandal is all yours for top of the line convenience and safety. The shoe also won’t bore you with its weight, as it comes super light and is comfortable on the legs for an all-day use. Take unlikely manufacturing flaws away and you have one of the best beginner water shoes in the market to cash in on. As you would expect, the Vibram Men’s Signa Athletic Boating Shoe comes with a Vibram wave grip compound that aids good traction on wet surfaces. There are also lots of drainage holes to keep your legs moist free all day long. This water shoe additionally has a polyester mesh that makes it super easy to maintain breathability and freshness inside. The rubber sole notches up its traction and the arch support is just right for many individuals. As some users complain of a slightly uncomfortable arch design, iron this gripe out and you will be all set to get in your favourite waters for a thrilling kayak fishing adventure! There you go on one of the finest footwear brands out there. Bursting into limelight with its pairs of hiking shoes, Merrell water shoes are also top favourites for many users. So, if you are looking to get a Merrell branded footwear for kayak fishing, the Merrell Men’s All Out Blaze Sieve Water Shoe could be your best buy. With comfort, solidity and good traction all yours, the All Out Blaze Sieve Water Shoe makes kayaking fun all day. It also has a 3 mm lug depth and rugged sole design which is what you want for good traction and rigidity on rough surfaces. The All Out Blaze Sieve Water Shoe is extremely light and snugs up well for most individuals. Chose the right size to get the best out of its arch support design and have a sensational time kayak fishing in the Merrell All Out Blaze Sieve Water Shoe! Another decent outdoor footwear is the Speedo Men’s Seaside Lace 4.0 Water Shoe. Though it appears slightly sturdy on the outside, the footwear is pretty much light when worn. The shoe comes with an S-trac outsole that provides good traction. The textile upper design looks just as great. You don’t want a shoe that gets pulled away from your legs in wet terrains. So be happy to know that the Seaside Lace 4.0 comes with a bungee elastic lace closure that provides better compact feel when kayak fishing. Simply pull tab at heel and you are all set to snug your feet right in. The lace design is decent so you can adjust conveniently. Its hydrophobic design ensures it adequately steers away infiltrating water. Colour mavens have three variants to choose from; Black/Insignia Blue, Insignia Blue/Bonewhite and Black/Insignia Blue. Barring manufacturing issues that might dent the expected product quality, the Speedo Men’s Seaside Lace 4.0 makes a good case when looking to get a kayak fishing water shoe. The Dreamcity Men’s Water Shoes is your ideal pick when looking for a clean, fashionable and visually appealing footwear for all your water needs. Having water splash into your gear and feet is all too likely when kayak fishing. And in good combination with heat and poor draining shoes, you know what to expect. Blisters! However, this nifty piece of footwear does more than enough to keep you safe from blisters, water critters and intense moisture when kayak fishing. The mesh upper is durable and provides all the breathability you need. For even better feet comfort, the footwear has a specially designed ComforDry sock liner. The insoles are as mushy as you want and the shoe design is made of 90% fabric. You don’t have to wait for extended periods before a reuse as the shoe dries pretty quickly. With a removable liner that rules out growth of mildew and superb versatility that welcomes all of horseback riding, mountain hiking and jet-skiing, you likely won’t go wrong settling for the Dreamcity Men’s Water Shoes when shopping for a sublime kayak fishing shoe! Although not exhaustive, there you go on some of the best water shoes around. Getting one of these pieces should do justice to all your needs when shopping for the best shoes for kayak fishing. However, there are a few things to look out for before settling for a matching water shoe. For example, if you will be fishing in a slightly turbulent water, or there are high chances of hitting rock pieces and water mysteries, you’ll want to get a pair of shoe that’s up for all of them. Here’s where the built-in pad ankle protection of Merrell Men’s All Out Blaze Sieve Water Shoe will come in handy. Merrell also leads the pack if colours do the magic for you, so cash in on any of the black, light brown, brindle, dark slate, red, olive or castle rock pieces of Merrell Men’s All Out Blaze Sieve Water Shoe! 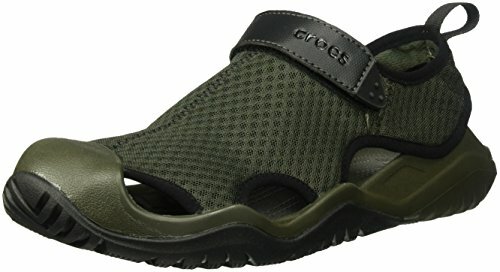 Kayak fishing shoes are expectedly superb when used on water, but if you’ll be engaging in onshore activities after kayak fishing, or want a piece of footwear that won’t complain about full swing attacks from pieces of rocks and water critters, the Crocs Men’s Swiftwater Mesh Sandal is what you want. 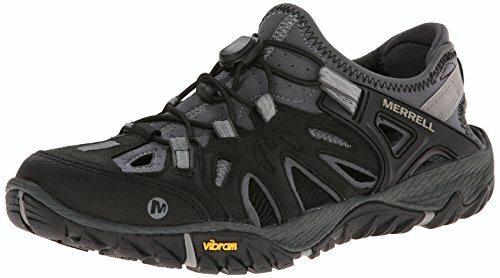 Another worthy shoe with great versatility regardless of the environment is the Vibram Men’s Signa Athletic Boating Shoe. The shoe comes with a rubber sole and additionally has a Wave grip rubber outsole that provides everything you need when taking on other challenges. There is also a toe pocket that increases flexibility so you don’t get stuck whichever way you stride along. For those constantly dealing with water shoes coming off when kayak fishing, the webbing lacing overlays and quick-adjusting bungee strap with toggle closure of Speedo Men’s Seaside Lace 4.0 Water Shoe will likely not disappoint this time. 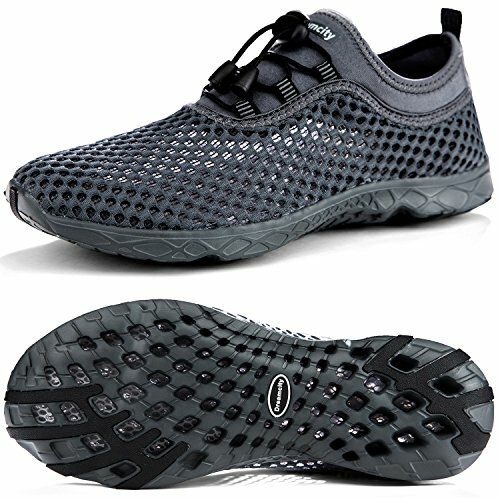 While all these shoes provide decent breathability features for better internal conditions, Dreamcity Men’s Water Shoes probably wins the breathability department with its Breathable and durable air mesh. Its ComforDry sock liner further keeps your feet perfect all day. One popular complaint to watch out for before selecting a water shoe is your size. Arch support is key, but picking the wrong pair of shoes leaves little to be desired. A workaround for some buyers is to purchase a slightly bigger size to improve breathability; you can consider that if you have arch concerns. Whichever option you decide to go with, an ancillary gear you want to put on before getting busy is a life jacket. So get your kayak fishing apparel ready, put on the right water shoes and good luck on the waters!